Today, there are a variety of ways to heat your home, but boilers have been a popular heating choice for decades because of their simplicity and reliability. At Oliver, we offer boilers that can keep your space cozy and comfortable all winter long. If you already have a boiler that’s in need of service, our repair experts can correct virtually any situation quickly to restore your heat. 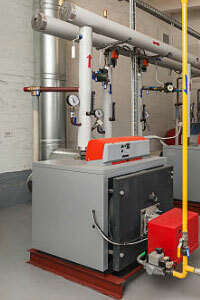 Boilers rely on water to operate and can be powered by gas, oil, or propane. Each type of fuel has its own benefits and which you choose depends on what’s available to you and what your needs are. Some boilers (called steam boilers) are designed to turn water into steam, then apply gravity and pressure to create heat. Other boilers (called hot water boilers) are designed to heat water and circulate it through a piping system to create heat. While hot water boilers are usually more efficient, some homeowners prefer the method of steam boilers. At Oliver, we’ve been offering quality HVAC services to homeowners since 1971. If you’re looking for a new or replacement boiler, we can help you find the right size to heat your home and the most energy-efficient model to help you reduce your carbon footprint. And if you’re experiencing trouble with your current boiler, such as noises, smells, or a reduction in heat, our experts have the tools and the knowledge to repair it right. For the best boiler service, don’t hesitate to contact Oliver today.